Batman's Joker plus Barack Obama equals socialism? Around election time a piece of pop art helped to propel Barack Obama's message of optimism. Shepard Fairey's iconic red, white, and blue poster of Obama looking professorial helped sell the future president's message of hope. Now a new O poster is taking a similar, if dastardly, direction. And it's got Chicago written all over it. 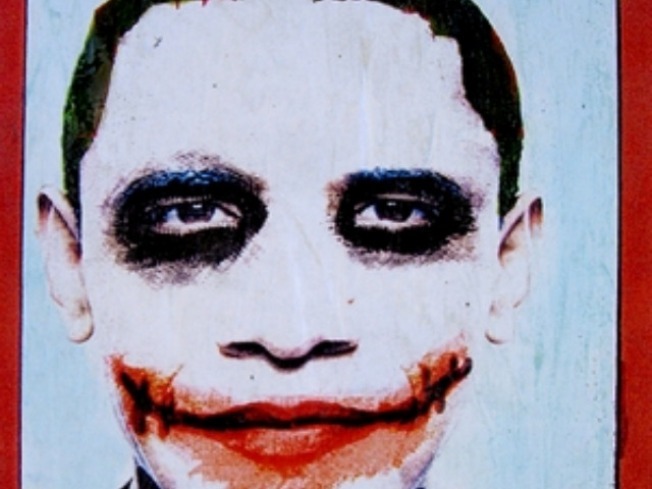 Posters by an anonymous graffiti artist used the make-up scheme from Heath Ledger’s "The Dark Knight" Joker character (filmed in Chi) and put it on a photograph of President Obama’s face with the word "socialism,' emblazoned along the bottom. The posters have begun popping up in Los Angeles this week. Joke all you want, but the eerie message from this artist’s Chicago-rooted political propaganda is daunting. Why so serious? Maybe because this is the future of the American government that we’re talking about.